First, the standard narrative of the American penal system begins at some version of a starting point in which prisons were devoted, at least in part, to rehabilitative aims. From there, with the rise of “tough-on-crime” politics, the collapse of liberalism, the crisis of faith in the possibility of rehabilitation, etc. (choose your favorite explanation), beginning in roughly the 1970s, states began to adopt more explicitly punitive, retributive aims in punishment. Not only were prisons stripped of educational and job programs, but states also began sending a wider range of offenders to prison, and for longer — yielding the explosion in prison populations of the past 30 years. 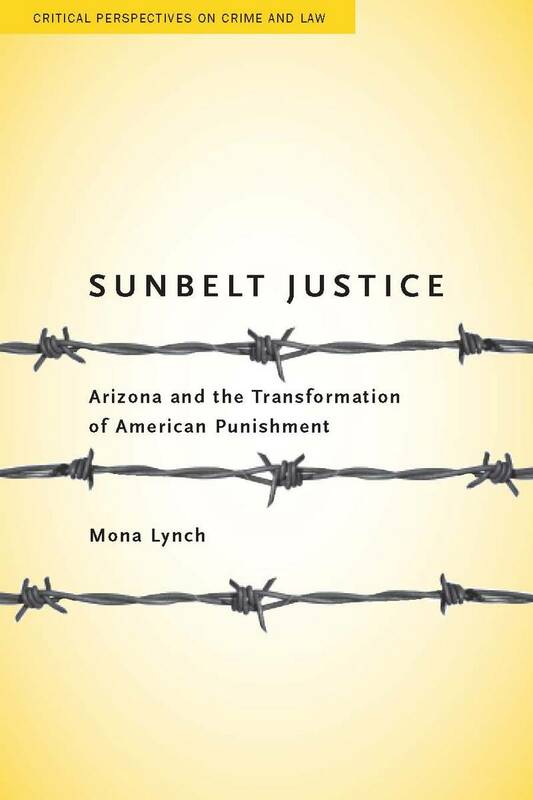 Lynch challenges that narrative by pointing out that at least in Arizona, and perhaps in the Sunbelt more generally, there had never been much of a commitment to rehabilitation. Arizona could serve as “a prototype of postrehabilitative penology” in large part because its Department of Corrections “had no ties to the progressive ideals that had shaped other state penal systems” (p. 20). it is … strikingly clear that in the case of Arizona, the push toward mass incarceration was not a bottom-up process. The catalysts for growth were primarily intragovernmental at the state level and did not appear to be prompted by significant populist constituent pressure, by local law enforcement pressure, or even by any careful legislative analysis of the crime problem. … [T]he legislature became more proactive in passing tougher sentencing legislation that increased sentence lengths and decreased autonomy and discretion at both ends of the system. And, for the first time in the state’s history, the legislative majority became more willing to invest significant amounts of money in the penal hardware needed to comply with the newly enacted tough-on-crime legislation. Now, it’s somewhat distressing to read that a state’s prison population could explode exponentially, not because of policies that the state’s citizens necessarily wanted, but basically as the consequence of bureaucratic infighting and legislative grandstanding. But as someone who hopes to see this country adopt saner criminal justice policies and turn back the tide of mass incarceration, I also found reason for hope in these two findings. If Lynch is right on both counts, then there’s no need to assume that, in arguing for alternatives to incarceration, saner sentencing policy, renewed attention to rehabilitation and reentry programs, etc., we’re bucking the democratic tide, or going up against 30 years of public opinion in favor of mass incarceration. Rather, it’s possible that mass incarceration has been simply the tragic result of a whole series of contingencies and structural developments, and not a result that the majority of American voters ever intended. I actually remember when the Arizona State Legislature removed references to rehabilitation as a goal of the Criminal Code. Once they did that all bets were off. Mandatory Sentencing has been one of the most ill-conceived, expensive and tragic experiments in public policy in the history of Arizona. The sad thing is that in the face of the undeniable failure of mandatory sentencing many in the Arizona State Legislature still don’t get it. Recently, I had the opportunity to conduct Rule of Law training in Central Asia. While conducting a training for judges in Tajikistan – a moderately conservative Muslim country just north of Afghanistan – I was surprised that the judges expressed horror when I described the severity of the criminal code punishments for non-violent crimes in my home State of Arizona. I know of one Arizona inmate who is serving a de facto life sentence for what was essentially a forgery and fraud-related crime that involved no violence whatsoever.